September 14, 2018 Pirapat Ruchiwit, M.D. Exercising too strenuously could result in an injury that may damage muscles or one of the various joints in the body. Avoid using the affected body part after an injury has occurred. For the first 48 hours after an injury, the application of any form of heat should be avoided. Exercise is great for everybody, but exercise that is too strenuous could lead to injuries that can have debilitative effects on the body’s muscles and joints, especially those joints which are responsible for weight distribution, such as the knees and ankles. 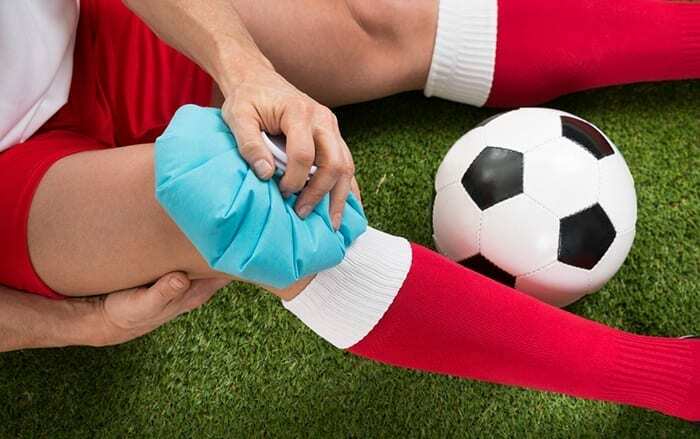 The sports for which ankle or knee injuries are most common are those that involve bodily contact or heavy impacts, such as football or rugby. However, other sports which involve moving the whole body, such as golf (where the body rotates and moves during the swing stage), can also lead to knee or ankle injuries. Regular bruising: Generally, muscle relaxant medication or anti-inflammatories are used to help reduce pain. The joints in the area of the bruising should also be rested. Tendon or cartilage injuries: A splint may be required to help stabilize the injured joint. Severe injuries: Injuries which involve a torn tendon lead to a complete loss of muscle strength in the joint and may require surgery. Injuries that occur due to muscle contraction may happen because of a sudden and extreme contraction, which causes a tear in the muscle fibers’ blood vessels. Alternatively, muscle injuries can result from prolonged muscle group contractions, also known as “overuse injuries”. This can happen when training with weights that are too heavy or when lifting weights repeatedly for a long period of time without an appropriate rest in-between. Runner’s usually experience pain in and around the kneecap, particularly when running up and down stairs. They may also feel pain in the back of the knee joint when standing up after having sat for a while. This kind of pain is often caused by hill training or by increasing training runs before the body is fully prepared for them. Other reasons include a lack of core body muscle strength, flat-footedness and weak quadriceps. R = Rest: Rest and avoid using the affected area, especially within the first six hours after the injury has occurred. However, injuries that have been sustained during exercise or sport usually require a rest period of at least 48 hours before the injured body part can be used and moved again. I = Ice: Ice or something cold should be applied to the affected area to stem the blood flow, as well as to reduce inflammation and pain. Generally, ice should be applied to the area for between 10–20 minutes per time, with a 5-minute break each time. This should be carried out continuously until the swelling is reduced, or approximately 2–3 times per day. Ice packs may be used for this step, as they hold their temperature for between 45-60 minutes. They should be wrapped in a cloth to stop the ice pack from coming into direct contact with the skin. If an ice pack is unavailable, or if the injured area is larger than the size of a single ice pack, a bag of ice or a cloth which has been in the freezer may also be used. Another option is to use a cooling spray, which can temporarily relieve pain. These sprays are suitable for areas of the body where the skin is not that thick, such as on the chin, knuckles and ankles. C = Compression: Tightly wrap the affected area with a cloth or bandaging to reduce blood flow to the injured body part. The cloth used should be wrapped tightly around the injured body part, preferably with thick bandaging. When wrapping the injury, the areas above and below the injured body part should be wrapped first before the affected area is wrapped. This step may also be used alongside applying ice to the injury. E = Elevation: This requires lifting the injured body part to a level that is higher than the heart, in order to make it easier for the blood to flow back to the heart. Furthermore, this can help reduce pressure from fluids attempting to enter the injured area, therefore reducing swelling and inflammation. When laying down, it is advised that the leg or foot be placed on a pillow. When sitting, the injured foot can be placed on a chair. In extreme cases, the elevation period should be extended to around 24–48 hours. During the first 48 hours after an injury, all forms of heat should be avoided. Heat will cause blood vessels to expand, which leads lead to increased blood flow to the affected area. Increased blood flow will cause inflammation of the muscle tissue around the injured body part, which in turn leads to increased pain and prolongs the injury’s recovery time. While playing sports is obviously a great thing, carefully preparing your body for exercise is key to injury prevention. A warm-up should be carried out before each and every exercise session, to ensure your muscles are ready for a workout and to prevent injury. 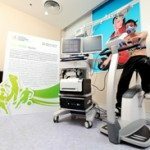 Moreover, to ensure that your technique is correct, carefully studying the particular sport you are interested in can not only reduce the chances of sustaining an injury while playing that sport. It will also allow you to train safely and in a way that will lead to a prolonged period of good health. Injuries from Popular Sports Exercising too strenuously could result in an injury that may damage muscles or one of the various joints in the body. M.D., Faculty of Medicine Rangsit University, 2003.